On a trip to the post office, I walked past this tree. The hearts glittered in the weak winter sun. It made me smile. Later that day, I read an article about a dispute over a yard sign that escalated into lawsuits resulting in the bankruptcy of a homeowners association. Twenty percent of Americans live in neighborhoods that fall under the auspices of such associations. They must submit to rules about the style of mailboxes, color of doors and the allowance (or not) of "yard art." 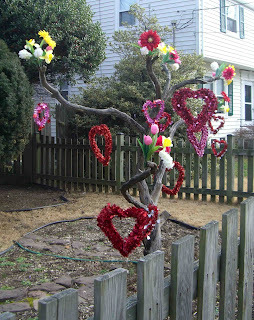 This Valentine tree would not be deemed acceptable. Whether or not you approve of mylar hearts and plastic flowers, there is something in the human spirit that makes us want to embellish and personalize our surroundings. For me, this tree represents an enthusiasm for life, for the various holidays and occasions that mark the year. I am grateful that no rules or covenants stifle my neighbor's creativity and am looking forward to whatever comes next. Perhaps shamrocks or Easter eggs?